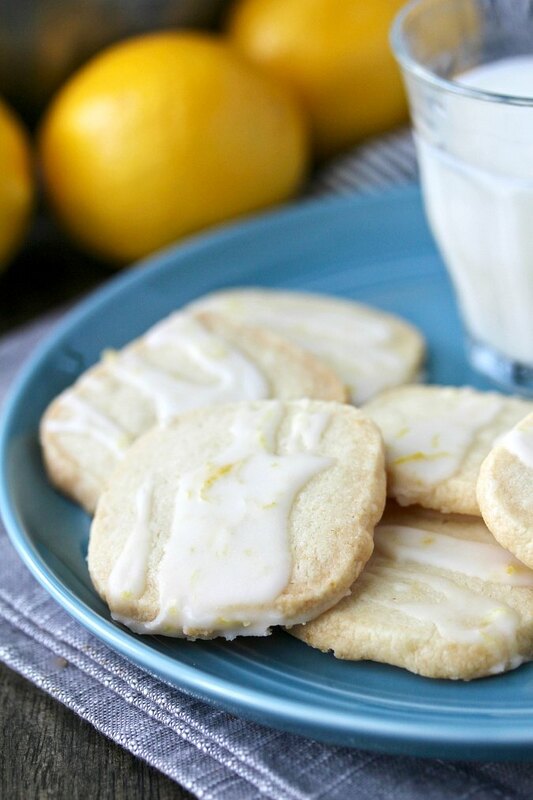 You make these lemon shortbread cookies by mixing the dry ingredients with cold butter cut into small pieces with a stand mixer until you get a buttery crumb. Then you add the vanilla and lemon juice and mix until you get large clumps of dough. Once you've created the dough, you form it into square sided logs and refrigerate them to be sliced and baked later. If someone told me I had to choose one style of cookie that is my favorite and would be the only type of cookie I could make/eat for the rest of my life, it would be shortbread. For one thing, shortbread cookies don't include any baking powder or baking soda, so there is less chance of anything going haywire. You pretty much place the shaped dough on the baking sheet, bake them, and they emerge in about the same shape. Second, you can add anything to shortbread cookies, including chocolate chips, so I could "sort of" live without chocolate chip cookies. Sort of. You can also dip them in chocolate. I'm pretty sure that won't break the rules. P.S. If you want to get fancy, you can call them sablés and feel all French! What are your favorite shortbread cookies? I can't answer that question. That would be like choosing my favorite color. However, here are some of my favorites. Demerara Shortbread Cookies: These are simple and complex at the same time. They also have an amazing salty sweet hint of caramel. Crystalized Ginger Shortbread Cookies: These cookies are totally elegant and sophisticated. Their flavor is very "grown up." Espresso Chocolate Sablés: Proof that you can still enjoy chocolate chip cookies even if you are limited to shortbread. Cornmeal Sablés: Pretty much cornbread in cookie form. Vanilla Bean Sablés: Check out the flecks of vanilla in these cookies! Toffee and Chocolate Shortbread Cookies: Filled with toffee bits and dipped in chocolate, these cookies will melt your heart. Who doesn't love a Heath Bar? First, the easy last minute way: Make the cookie dough, refrigerate it, slice it, and bake it. 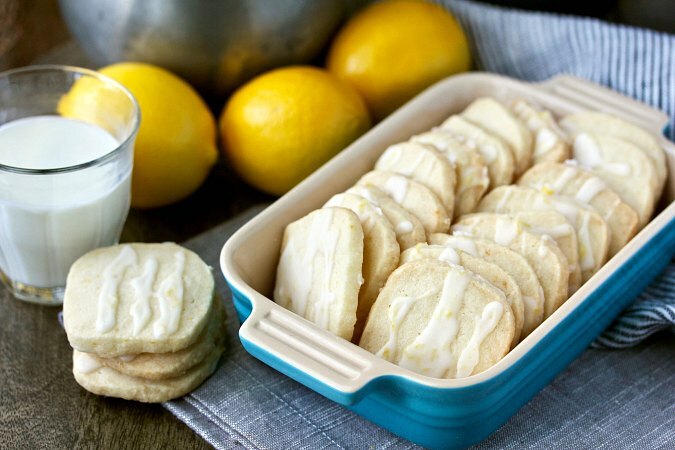 Second, the easy last minute way, plus a second step to take the cookies to a new level: Make the cookie dough, refrigerate it, slice it, bake it, and then drizzle the cookies with a lemon glaze. 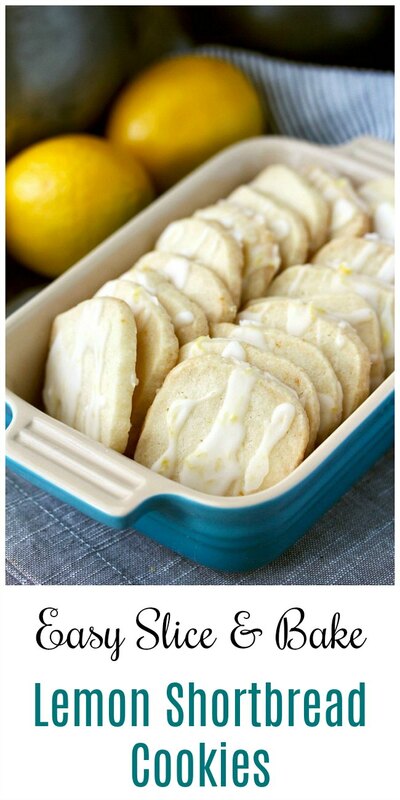 You will have to let the lemon glaze dry, but it's worth the extra step. 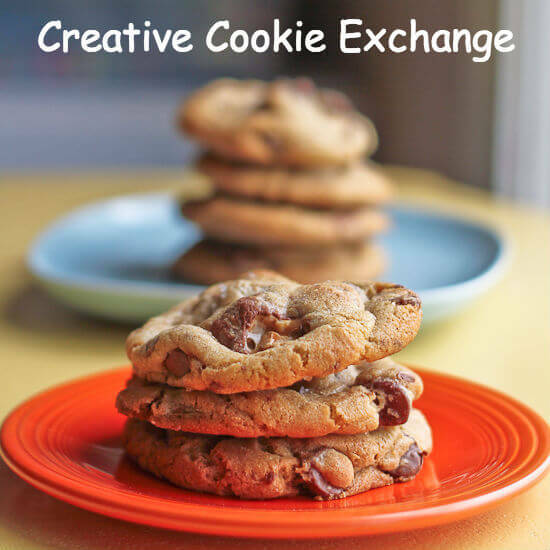 This month, the Creative Cookie Exchange members, hosted by Stacy of Food Lust People Love, are offering Easy Last Minute Cookie recipes. In the bowl of a stand mixer, whisk together the flour, cornstarch, granulated sugar, powdered sugar, and salt. Add half of the butter pieces and the lemon zest and mix with the paddle attachment for about 2 minutes on medium, until you have a crumbly mixture. Add the rest of the butter and mix until the flour is just fully incorporated, about one minute. Add the lemon juice and vanilla and mix until the dough comes together in large clumps, about 45 seconds. Divide the dough in half and form each half into a log, about 5 inches long. Press the sides of the log with your hands to create squared 1 1/2 inch sides. Wrap in plastic wrap and refrigerate for 3 hours or overnight. You can also freeze the the dough for up to 2 months (defrost frozen dough in the refrigerator for three hours before slicing). When ready to bake the cookies, heat the oven to 325 degrees F and line two baking sheets with parchment paper. Slice each log into 1/4 inch slices, and place the dough on the baking sheet, about 1 inch apart. Bake the cookies, one sheet at a time, for about 25 minutes, until the edges just begin to brown. Let cool on the baking sheet for 10 minutes, and then move to a cooling rack. Store the cookies in an airtight container for up to four days. 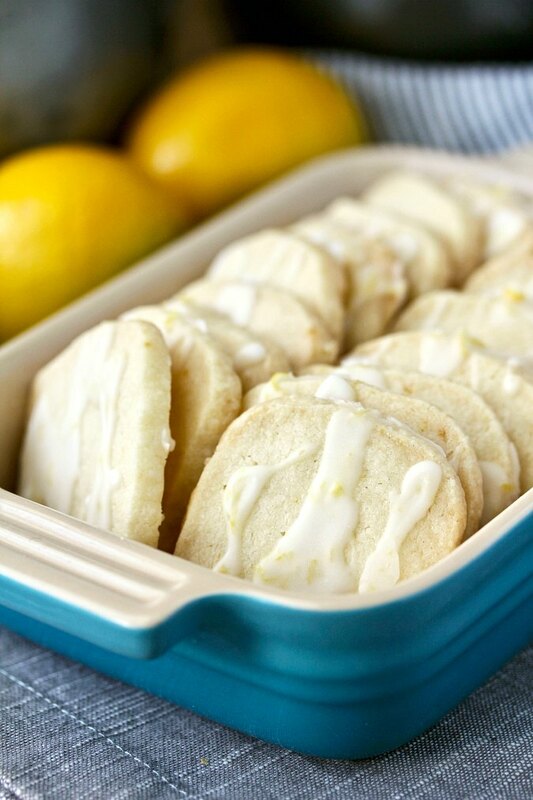 Mix the powdered sugar with the grated lemon zest and then whisk in enough lemon juice to make a drippy glaze. Drizzle the glaze over the cookies and let dry until hardened. I'm a fan of shortbread too, Karen, especially when flavored with citrus. Love the square shape and the drizzle! I agree with you, Karen, shortbread is the type of cookie that I could eat every day and never tire of! Your lemon version looks wonderful! we are huge shortbread lovers! and anything lemony makes me happy too... so these are perfection! Awww. Thanks!! I'm with you all of the way. It is easy to see why shortbread is a favorite as these look amazing, as do the ones you linked to. Sometimes the most delicious baked goods are those with simple, good quality ingredients that speak for themselves. These shortbread cookies looks amazing!! I'm pinning them to make!! Thanks Kim! They are tasty for sure.